La campagne sauvage de Madère en dehors de Funchal est dominée par les hauts sommets et la forêt subéquatoriale Laurissilva. Vous devrez donc relever un nouveau défi hors des sentiers battus pendant votre exploration. 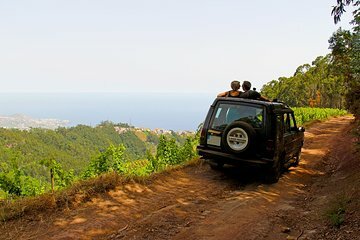 Lors de ce safari touristique d'une demi-journée, vous couvrirez le terrain avec une jeep puissante et découvrirez facilement des sites d'intérêt, tels que La Boca dos Namorados, Covão et Fajã das Galinhas. Avec le transfert inclus depuis et vers votre hébergement de Funchal, rien n'est plus facile que d'atteindre les grands espaces sauvages. The half-day jeep tour was just what I wanted - a close-up look at the amazing topography of Madeira. Our guide, Nuno, was energetic and knowledgeable. We went to viewpoints with vertical views and learned some of the history of the island. I highly recommend this tour for a good overview of Madeira and primer for other activities there. Our tour guide was GREAT - he was so passionate about the island and we learnt so much from him! he also asked us all to switch seats so that everyone got a turn to have a different view in the car. my husband was a little upset that we couldnt stand up like in the picture! The tour was jsut long enough to get a good prospectus of one side of the island . Fantastic day out with amazing scenery. Our guide /driver Nuno was amazing and took us to all the best viewpoints, he was so knowledgeable and accommodating to the needs of our group. Off road was a highlight. A day to remember!!! I would highly recommend this tour.